It is March. It is the third year in my house, 1976. It is cold. I cook and heat with wood. I am lassoing dead branches out of trees. I ran out of wood. I was born and raised in Florida. What did I know? I was learning. The next year my neighbor had his big oaks logged for money. They left huge tops. I spent all summer cutting wood, bring it in, stacking it and covering it. I got three years worth. I stacked the dead limbs at the front. From then on, I was never without three years of wood drying. I was learning. I left the wood unsplit. I love to split wood with a wedge and splitting maul. Each piece is different. You learn where and how to hit it. Each day I split the day’s wood. I always had a little extra in case I got sick or didn’t have time. I was learning. I still love to split wood and do a little all winter. My first wood I cut with a six foot saw and an axe.It was a downed log. I was in fairly good condition. That was work. So I bought a huge chainsaw that weighed a lot. That is why it was so cheap. After using it a while I took the chain off to sharpen it. When I put it back on it wouldn’t cut very well. Finally I went to my farmer neighbor to ask him what was the problem. Without keeling over laughing, he suggested I turn the blade around to the cutters were going the right direction. And you don’t need to take the chain off to sharpen it. I was learning. Water is critical to all life. I don’t understand the insanity of messing with it by fracking and oil sands. Where do you get your water? I can’t tell you how to protect yourself and supply yourself in the city. I can tell you that if you live in a town with a water tower, make sure you have a sufficient back-up generator. You can always make alcohol or bio-diesel to run it. If you have your own well, I can tell you how Ihave had my wells. Below you see a farm pump set up that is operated by hand. 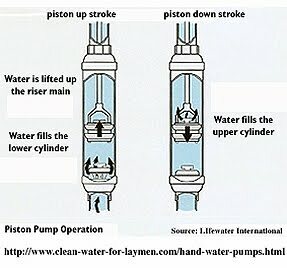 At the bottom is a cylinder that is the actual pumping part. 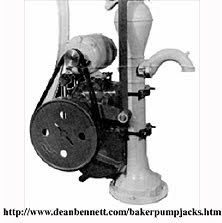 What is nice about this is that the gasket in the cylinder and packing in the pump head are the only parts that have wear. The gasket is called the leathers because they are often made of leather and can be made on the farm. The packing is graphite cord easily found at the local hardware store but pork rind can be used also. The pump head lever moves the rod up and down causing water to flow into the cylinder at the bottom of the well and then up the pipe to the spigot on the pump head. This well can lift water above the pump head easily 20 feet. The packing creates a water tight seal for the lifting. 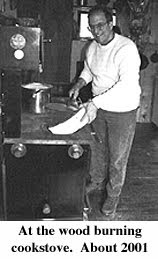 When I lived off the grid, this set up was inside a small room off the main house. For ten years, when I lived with no electricity, I pumped water into a retaining tank above and it gravity fed to the sink (I had an outhouse at the time). 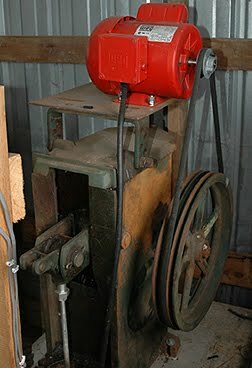 When I got electricity from solar panels and wind, I put on a pump jackwith a 1/2 horse power 12 volt motor that ran off my batteries. If I did not have electricity available, it took five minutes to disconnect the pump jack and be able to pump by hand. Below is a picture of how that pump jack looked. At the orchard we are developing, I had a four-inch well put in for irrigation. I have the same cylinder and rod set up with it but a different kind of pump jack. It is run by 1/2 horse power motor. I am having a bicycle set-up built to pump the water. I am paying for the materials at the local high school shop class where they will build several. 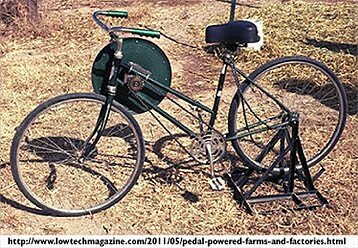 Below is a picture of the other kind of pump jack and also a possible bicycle design. Below is the house at the orchard. The part you see was built in the 1940s. The inside was worse than the outside. We replaced the floor with insulation below the concrete. We tore out all the plasterboard and insulation, added two by two so we could have six inches of insulation on the walls and ceilings down stairs. We did the same upstairs. Today it was 30 degrees outside and the passive solar had it to 60 degrees. If you look closely you can see a bucket in the window that has a volunteer tomato plant we transferred. 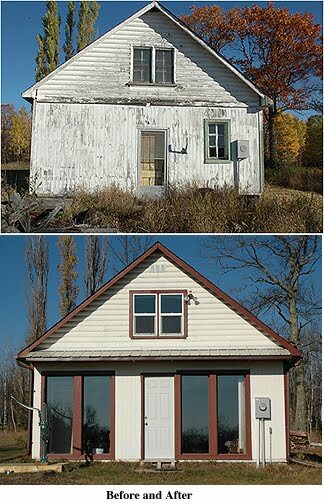 There is no heat other than passive solar. So far the windows and the thermal mass of the floor is allowing the tomato plant to flourish. Our greenhouse at our home has tomatoes, peppers, lettuce and cabbage growing to beat the band. This is an experiment. We are learning. You can see the farm pump out front. I had the electric pump replaced with this set up. I have a pump jack for it and motors but prefer it as it is. We can manually pump water to a pressure tank inside the house. Kathy’s (my partner) 7 year old grandchild can pump it. When people would come visit me at my old place during those first ten years when I had no electricity, I told them they could use all the water they wanted. They only had to pump it. It is amazing how quickly people learned to conserve water. They were learning. 1. Shut the power to the pump off and drain the pressure tank. 2. Disconnect the pipe from the pressure tank or pump. For a submersible pump, the point of connection with the surface plumbing will be the pressure tank. The plumbing will connect directly to the pump on any surface pump. 3. Tighten two pipe wrenches on the top of the pipe and lift. Place the third pipe wrench loosely on the pipe just above the top of the well casing. This will prevent the pipe from falling into the casing if you lose your grip. Lift the pipe until you reach shoulder height. 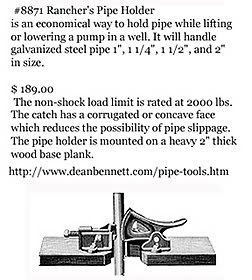 Lower the pipe slightly until it rests firmly in the pipe wrench on the top of the well casing. 4. Tighten one of the wrenches you used for lifting just above the wrench holdingthe pipe in place on top of the casing. Lift the pipe until you can fit the second wrench underneath the two used for lifting. 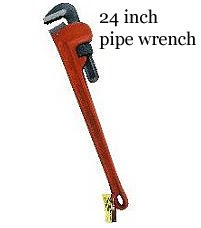 Place the second wrench loosely around the pipe to use as a safety lock. Continue lifting and alternating wrenches until the pipe is completely removed from the casing. When removing steel pipe from the well, stop at each pipe joint and unscrew the pipe from the fitting. Place the loose joint well out of the way before lifting the next joint. Electrical wire will be attached to the outside of the pipe for a submersible pump. Remove the wires from the pipe and coil them neatly as the pipe is lifted out of the well. Clean and inspect the wires for breaks or frays in the insulation before reuse. I think we need to do that with all resources. We need to be learning. Beautiful, John. Regards, Bruce Thomson in New Zealand. Bruce - good to hear from you. Hope all is well. Thanks for the suggestions on the many permutations of farm pumps, John. We just added a farm pump to our electric well for backup purposes, and the post makes me think about future possibilities for tanks. Do a little, observe, do a little more, adapt. We're learning (or relearning) every day. Water pump is somewhat really a wonderful source of water specially in much secluded areas where hose or pipe from water companies cannot be installed. I believe also that these water pump is a great help to our brothers and sisters. Thanks for blogging about this. Thanks for sharing with us. Flexitallic Ltd provides manufacturers, suppliers, exports, and importsPump packings. A few years ago I removed the pipe the hard way -- wrapped a towel round it tied to a come-along hung from a ladder positioned over the well. Things were exciting for a bit when I had one click left to go and the pipe was towering thirty feet above me. I yelled "Timber" for old times' sake. Thank you, lovely article. Hi, John. This is Juan from PO. Great blog. I added it to my favorites for future reference since my wife and I are building a small off grid Permaculture farm in Uruguay. Thanks for sharing all this! JP - Juan if you want to email me, I am fine with that. Good luck.